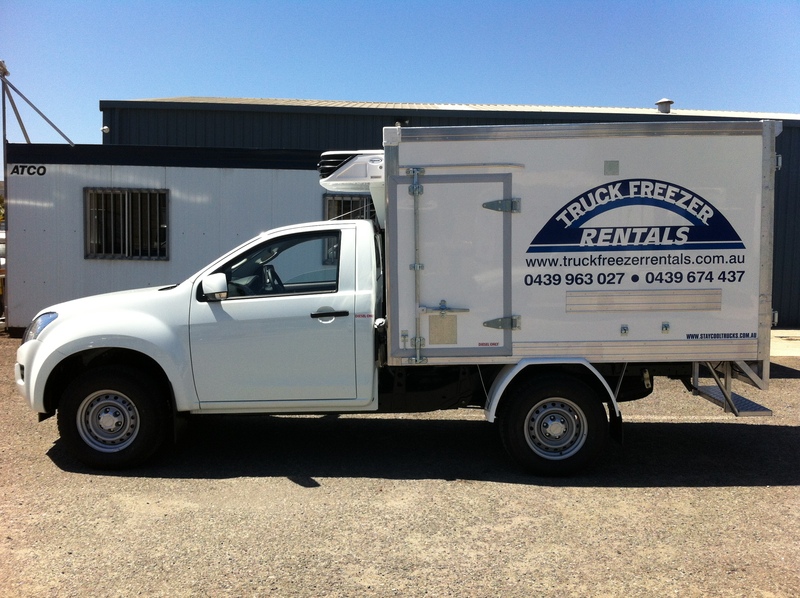 Truck Freezer Rentals takes pride in supplying a modern range of quality built refrigerated vehicles and trailers. The fleet contains a diversity of features including taillifts, electric standby and dual temperature compartments. 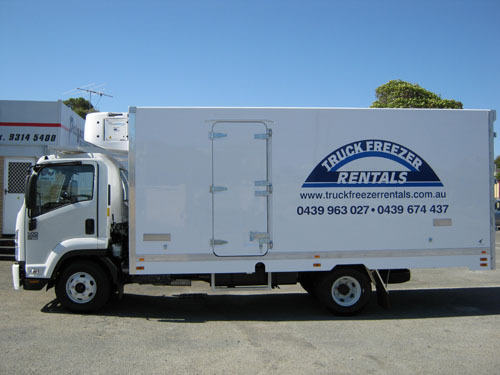 Truck Freezer Rentals uses Carrier and Thermoking refrigeration units to ensure excellent performance and reliability as well as superior efficiency and enhanced product protection. 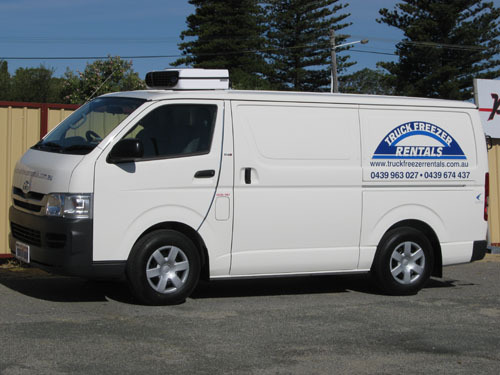 For rentals of 1 week or more a complimentary delivery of the vehicle within the metropolitan area is available. 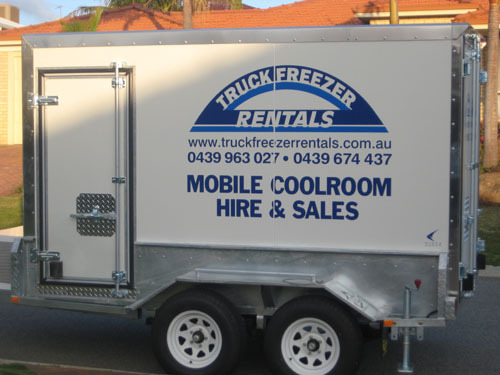 Truck Freezer Rentals offers a range of modern freezer- and coolroom trailers. They are very popular amongst caterers and are ideal for corporate functions, promotional events, weddings and parties. All trailers are available with or without shelving. For further details on our freezer- and coolroom trailers please click here. Coolrooms: Internal dimensions 2.9m(L) x 1.7m(H) x 1.6m(W) – Temperature range +5C to 0C, Household power (240V) or Generator (from 5 KVA) – Rear barn & side door – Shelving available – Thermal curtains. 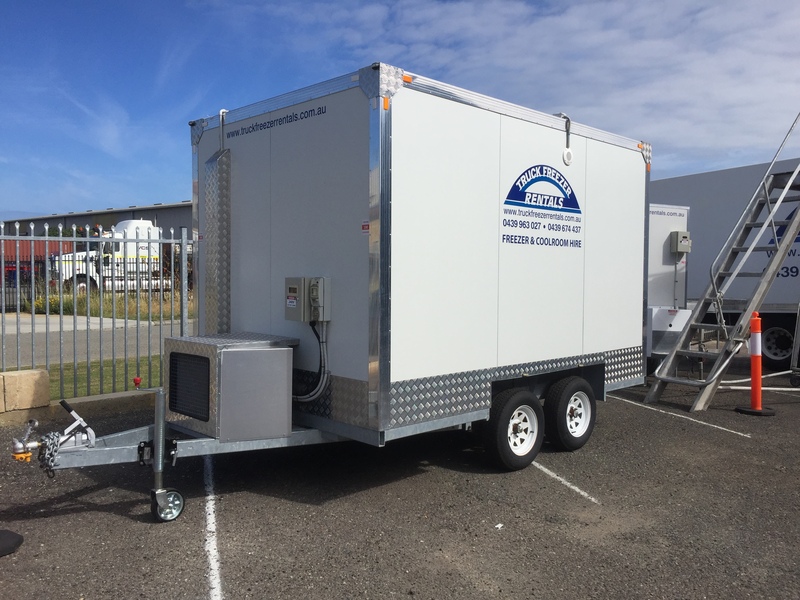 The latest addition to our trailer fleet is this extra large Coolroom Trailer. Ideal for those catering events, coolroom breakdowns/maintenance when a standard trailer just isn’t quite big enough. This trailer comes with ample shelving and plenty of walk-in height room. Runs on 15AMP power. click here. Coolroom: Internal dimensions 3.2m(L) x 1.9m(H) x 2.4m(W) – External dimensions 5.5m (L) x 3m (H) x 2.4m (W) Temperature range +5C to -18C, Power supply 15AMP or Generator – Single Rear Door – Shelving available . 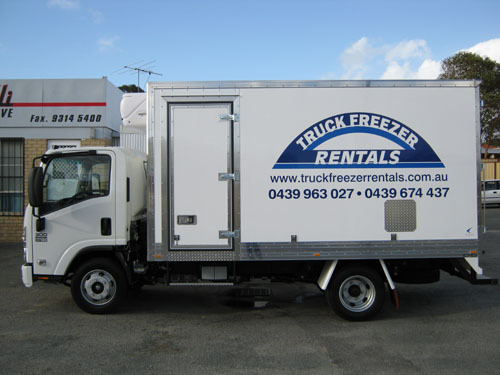 Truck Freezer Rentals offers fully fibreglassed refrigerated vans, which are suitable for drivers not familiar with overheight/overwidth transport equipment. 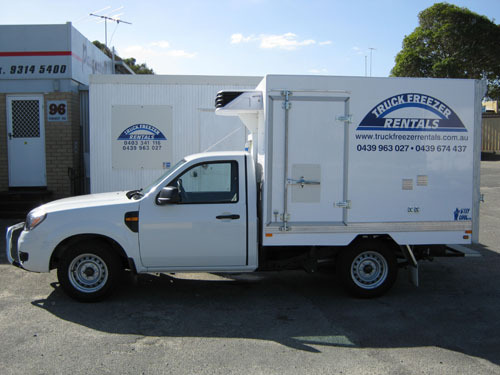 These vehicles are ideal for inner city deliveries with restricted access. 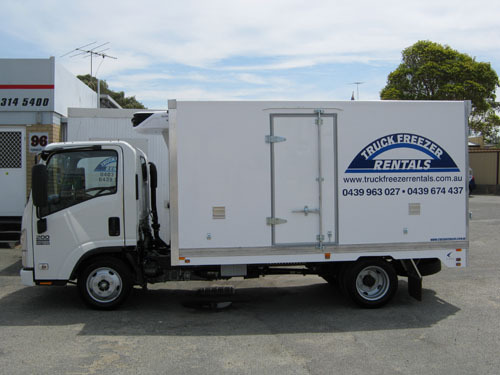 For further details on our refrigerated vans please click here. The compact design of the 1 Tonners makes them extremely versatile and userfriendly for applications such as inner city deliveries. These vehicles feature electric standby, which can be conveniently connected to standard household power for catering purposes or overnight refrigeration. For further details on our 1 Tonners please click here. The latest addition to our fleet, the Isuzu D-Max provides all your creature comforts, from power steering, automatic transmission to reversing camera. The D-Max has the capacity of a 2 pallet truck but with the versatility of a 1 Tonner. These vehicles also feature electric standby, for your overnight refrigeration convenience. click here. All 3 & 4 pallet trucks are conveniently licensed for a standard car licence. Truck Freezer Rentals offers 2 types of 3 pallet trucks: The standard 3 pallet truck, as well as a more compact version, which is built to “van dimensions”. These trucks are slightly narrower and have lower clearance heights making them ideal for deliveries with restricted access. For further details on our 3 and 4 pallet trucks please click here. For maximum temperature control and convenience all 6 pallet trucks feature rear as well as side access doors. Load lock and shoring bars ensure safe transportation of goods at all times and airconditioning provides comfort within the driver’s cab. For further details on our 6 pallet trucks please click here. 6 Pallet Trucks: Pallet Size: 6 – Internal Dimensions (L x H x W):4m x 2m x 2.4m – Temperature Range: +15C to –18C – Drivers Licence: LR & MR – Payload Capacity: 2.3t – 5t – Manual transmission (Automatic on selected models only) – Rear barn doors & side door – Load lock and shoring bars – Dividable bulkheads available. 8 and 10 pallet trucks feature a choice of slideaway or cantilever taillifts and are equipped with 3-Phase electric standby. On request dividable bulkheads are available for the vehicles, allowing a split of the compartment to accommodate frozen as well as refrigerated or dry goods. For further details on our 10 and 8 pallet trucks please click here. 10 Pallet Trucks: Pallet Size: 10 – Internal Dimensions (L x H x W): 6.6m x 2.2m x 2.4m – Temperature Range: +15C to –25C – Drivers Licence: MR – Electric Standby: 4 Pin/32 AMP/415 Volt – Payload Capacity: 6.2t – 2t slide-away tail lift – Rear barn doors – Load lock and shoring bars – Dividable bulkheads available. 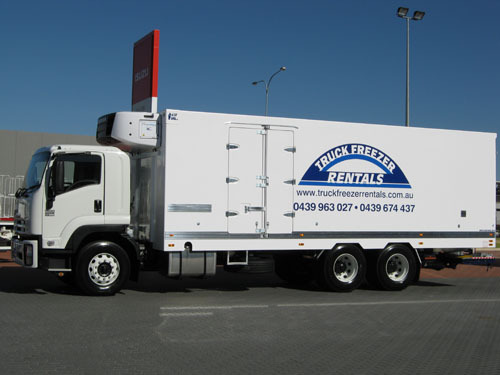 All trucks are equipped with fully insulated fibreglass bodies, effectively holding temperatures of up to –25C for maximum cooling results and safe transportation of fresh and frozen goods. Selected vehicles feature automatic transmission, meatrails and slideaway/cantilever taillifts ranging from 2t to 2.5t. For further details on our 14 and 12 pallet trucks please click here.